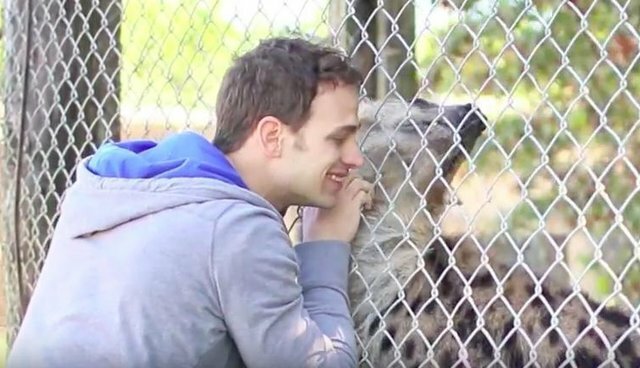 A video making the rounds purports to show a man reconnecting years later with the hyena he helped to raise. But the truth is a bit more sordid. 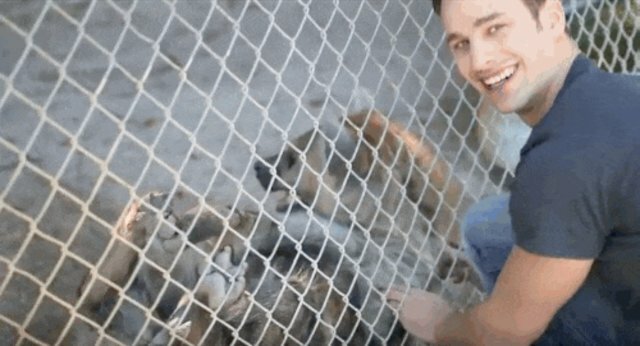 In the video, which was posted in 2014, Bryan Hawn arrives at the Octagon Wildlife Sanctuary in Punta Gorda, Florida, to surprise a hyena named Jake for her fourth birthday. Hawn says that he raised Jake since she was a baby. As soon as Hawn rounds the corner and approaches Jake's cage, the hyena starts squealing and chirping in excitement. She runs over to Hawn, who begins to pet her and embrace her through the chain link fence. At first glance, this video appears to be a heartwarming reunion between an animal and the person who cared for her. The real story is a bizarre and sad lesson about why exotic animals don't belong as pets. According to a 2011 article in the Miami New Times, Hawn purchased Jake as a baby from a private zoo after he decided dogs and other pets were "boring." "I wanted something on a huge scale and that would make people's mouths drop open," he told the outlet. "It came down to a wolf or a hyena ... If I could get a hyena to love me, I could prove to myself that I am a lovable person." Hawn was broke, so he stripped for a week to raise the money to purchase Jake. Knowing full well that it was illegal to keep a hyena without a license in his home state of Florida, Hawn lied to the zoo and told them he lived in Alabama. The zoo didn't bother to perform a background check. Hawn also says he wrestled with Jake every day to establish dominance, even biting at her as they played. According to the Miami New Times, it got to the point where when he let Jake out of her cage - where she was apparently kept - she would run right into the walls. Hawn told The Dodo that this quote was taken out of context, but he eventually realized that he couldn't continue to keep her. Hawn voluntarily reached out to wildlife officials. He faced no charges, while Jake bounced from facility to facility until she ended up at Octagon. Now, Hawn visits Jake and posts their encounters on his YouTube account. Below every video of her, which usually get quite a few hits, the aspiring singer/model/fitness instructor posts a link to an "inspiring" $20 e-book about how he acquired Jake, and solicits donations to something called "Jake's Wildlife Conservation." The supposed fund consists only of a PayPal link, with no explanation of where the funds go. Hawn also apparently moved on after Jake's departure, posting a series of videos in 2013 featuring the singing sultrily to his new pet, a sloth named Beamer (Warning: First link is decidedly NSFW). It appears Hawn later turned Beamer over to Octagon as well when he was done with him. "He was privately owned and living in an apartment in an empty room with a small box house, three sticks, one swinging basket and a closet door," the sanctuary says on a profile of a similar-looking two-toed sloth named Beamer. "The temperature was set at a constant 72 degrees, which is way too cold for these tropical rainforest canopy animals." The story's a cautionary tale about the fate of many "exotic" pets, who are often purchased by owners who know nothing about them or their care. For example, in his videos and in the interview, Hawn repeatedly refers to Jake as a "he." But according to Octagon's website, Jake is a female (female hyenas have elongated genitalia that can appear similar to penises). And the animals are the ones to suffer. Taken away from her mother at a young age, Jake grew up in an apartment with subpar care instead of in a large extended family. Though she clearly loves Hawn, the only real family she's ever known, she lost him, too. Animals like Jake, who were raised without the influences of their natural family and habitat, can often experience profound psychological issues. And she'll spend the rest of her life behind bars. But she's not alone. Each year, countless animals like Jake suffer in backyards and questionable zoos across the country, often being kept illegally or with minimal government oversight. For example, there are more tigers in backyards and roadside zoos across the U.S. then there are in the wild in the entire world. In some ways, Jake's one of the lucky ones because she escaped. If you'd like to support Jake's future, you can make a donation to Octagon here. To help former exotic pets like Jake, you can also make a donation to the Wild Animal Sanctuary, which provides a home to abused and abandoned animals. UPDATE: The Dodo spoke with Hawn, who asked that we share a video he made about Jake (relevant part begins at 2:30). He said that he was unhappy with how the Miami New Times portrayed him, and that Jake was treated well in his care. "When I first brought him to the zoological wildlife foundation the FDA inspector said jake was the healthiest and happiest most tame and calm hyena she had ever seen," Hawn said in an email. "The love that has been captured on film that is undeniable present."